Edited by Joseph M. Beilein Jr. and Matthew C. Hulbert. University Press of Kentucky, 2015. 246pp. Illustrations. Bibliography. Endnotes. Index. Hardcover. ISBN: 978-0-8131-6532-5. £31 from Amazon. This latest volume on American Civil War guerrillas consists of a Foreword by Christopher Phillips, an Introduction by the two editors, eight articles on guerrilla warfare in the South and an Afterword by Victoria E. Bynum. The Foreword is written by a friend of Michael Fellman, author of Inside War: The Guerrilla Conflict in Missouri during the American Civil War and deals with Fellman's book saying it "launched a new genre of Civil War writing". In their Introduction, the editors look at 'Black Flags and History, Authentic and Apocryphal'' citing as an example John Newman Edwards’ account of the Centralia massacre, where he claimed there were two black flags, one carried by each side; though there does not appear to be any such flags in any archive or museum. The articles themselves are a varied mix and the first is by Christopher Phillips, writer of the book’s Foreword, his sub-title being The Ideological Basis of Irregular Warfare in the Western Border States in which its author writes it would “explore various interpretive strands surrounding the proliferation of irregular warfare in the western border region”. Andrew William Fialka’s Controlled Chaos is sub-titled Spatiotemporal Patterns within Missouri’s Irregular Civil War and he sets out to remedy the paucity of the mapping of guerrilla violence, supplying a number of useful maps of his subject. Violence, Conflict and Loyalty in the Carolina Piedmont by David Brown and Patrick J. Doyle has a self-explanatory title and a useful map shows the area in question, stretching southwest through the Carolinas. Similarly, the title of Megan Kate Nelson’s Indians Make the Best Guerrillas or Native Americans and the War for the Desert Southwest, 1861-1862 immediately tells the reader what to expect from the article. The fifth chapter, The Business of Guerrilla Memory by Matthew C. Hulbert, one of the editors of this volume, is more distinctive in its topic, sub-titled Selling Massacres and the Captivity Narrative of Sergeant Thomas M. Goodman. It deals specifically with Union soldier Goodman who wrote a book, A Thrilling Record: Founded on Facts and Observations during Ten Days’ Experience with Col. Wm. T. Anderson, the Notorious Guerrilla Chieftain, available in 1868 for fifty cents. The next chapter, Tales of Race, Romance, and Irregular Warfare deals with the guerrillas in fiction, either in books or plays. The seventh chapter, like the fifth, is quite specific: In Search of Manse Jolly - Mythology and Facts in the Hunt for a Post-Civil War Guerrilla. Manse Jolly was born in Anderson District in South Carolina and, like Jesse James, fits many of the criteria that Eric Hobsbawm and Graham Seal used to define “social bandits” or “outlaw heroes”. The writer, Rod Andrew Jr., describes the myths surrounding Jolly and gives some of the truth behind the mythology. The final article, “Nothing but Truth is History”: William E. Connelley, William H. Gregg, and the Pillaging of Guerrilla History, is by the second of the editors, Joseph M. Beilein Jr. and tells of the use of Gregg’s memoir by Connelley, author of Quantrill and the Border Wars, who decided to write his own distorted version of the events. 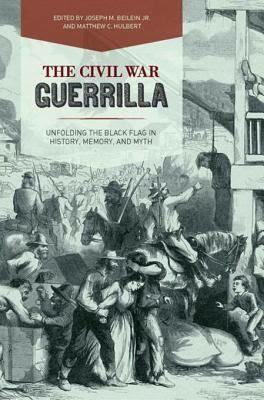 The Afterword, beginning with mention of Fellman’s Inside War, asks in part whether the guerrillas were the equivalent of modern ’freedom fighters’ or just civilians protecting themselves and their property, and completes an interesting volume, one which is well worth adding to any collection of books on Civil War guerrillas.